If your fiberglass shower pan has dulled or deteriorated to the point that you want to do something about it, you have a few options, but installing tile over the shower pan isn't one of them. 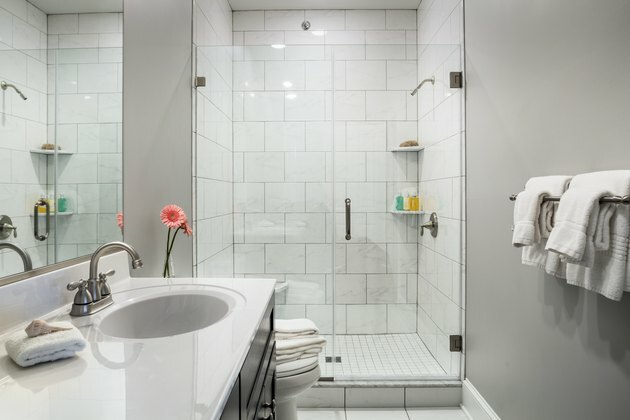 Tile professionals are virtually unanimous about this. A fiberglass pan is simply too flexible to support the mortar bed you need for tiling. The mortar will crack, and the tiles will also crack and separate. If you really want to replace a fiberglass or plastic shower floor with tile, you have to remove the existing floor and construct a solid backing for the mortar base. The proper way to tile over a fiberglass shower pan is to remove the pan. This isn't especially problematic if the pan was installed separately from the shower walls, but it can be tricky if the pan is part of a one-piece fiberglass stall, and it may need professional expertise. After removing the pan, you may need to remove 6 inches or more of material from the shower walls, and that's easier to do if the pan and walls are separate. The pan is probably supported by a base frame. This has to be removed and replaced with a solid plywood and fiber-cement substructure. The drain will probably also have to be replaced. After completing this rough-in, you lay a mortar bed that slopes toward the drain, lay a waterproof membrane and construct a curb. You then lay metal lath and a second layer of mortar before laying the tile. Can I Tile Over a Fiberglass Shower Stall? After resigning yourself to the fact that you need to remove the fiberglass pan before you can tile the shower floor, you may be wondering if it's okay to tile over the existing fiberglass shower walls of your one-piece stall. It isn't. The same flexibility issues apply. Even though you don't put your weight on the walls, you might lean against them, and doing so will crack the mortar backing and separate the tiles. Even if that weren't true, there's another important issue. Thin-set mortar won't stick to fiberglass, no matter how well you etch it. If you want to change your existing fiberglass or acrylic shower stall to tile, you have to remove the stall and install fiber-cement backer board. It's possible to revitalize a worn fiberglass shower pan or stall by painting or refinishing it. You should use special paint, such as aliphatic acrylic polyurethane, that will stand up to moisture. The procedure involves thoroughly cleaning and etching the fiberglass, but it's one that a homeowner can do, although a pro is more likely to achieve first class results. Depending on the shape of the shower and position of the drain, you may also be able to simply remove the existing pan and replace it with a porcelain shower pan. This still involves some demolition, but it's easier than installing a new tile floor, and the results can be spectacular. Can I Replace Just the Shower Pan in a Shower? What Kind of Mortar Do You Use in a Shower Pan?